This Camembert grilled cheese recipe is the perfect way to finish off a great BBQ party especially if you’re more of a cheese fan than a dessert aficionado. I picked up this grilled cheese recipe in Le Mans so special thanks to the Vincent family for introducing me to this knockout cheese course. You'll see many taking the wooden lid off the pack and pressing the center of the cheese to see if it is soft - this is wrong. Mainly because if enough people prod the same cheese in the same place it is inevitably going to be soft so the test is meaningless. 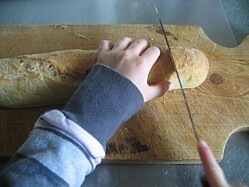 The right way to test whether the cheese is ripe is to squeeze it across the diameter and judge the softness. If there's no "give", put it back or buy it and be prepare to wait 2 weeks before you use it. One final point when buying Camembert is to ensure that it states "Au lait cru" on the box. This means that it is made from unpasturised milk. 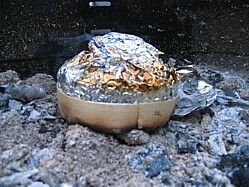 Wrap the cheese in foil, replace it in its wooden carton and drop it into the charcoal embers of the barbecue. Allow it to smolder while you make the garlic bread. In a heat proof pot, warm the butter gently so that it is soft and take care not to melt it. TIP - Soften half the butter first then if you do accidentally melt it (as I do regularly!) you can use the heat in the melted butter to soften the other half of the butter away from any other heat. Peel the garlic, finely chop it and mix it into the butter. Slice the bread at half inch intervals taking care to leave each slice attached to the next at the bottom and then paste the garlic butter mix into your incisions. 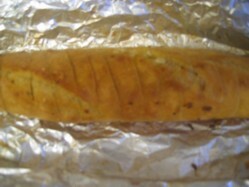 Wrap the whole thing in foil and toast gently over medium heat for about 15 – 20 minutes turning regularly and you’ll have crisp on the outside and a wonderful garlic aroma on the inside. Do remember to turn regularly because despite the protection of the aluminum foil it is still quite easy to burn your bread. Tear off a slice of garlic bread, spoon on some soft squidgy Camembert, accompany it with a glass of red and whatever you do, don’t count the calories!